Don’t just track time. Increase performance. Use 'clock' or 'personal' mode to enable any mobile device to be the world's most advanced biometric time clock. 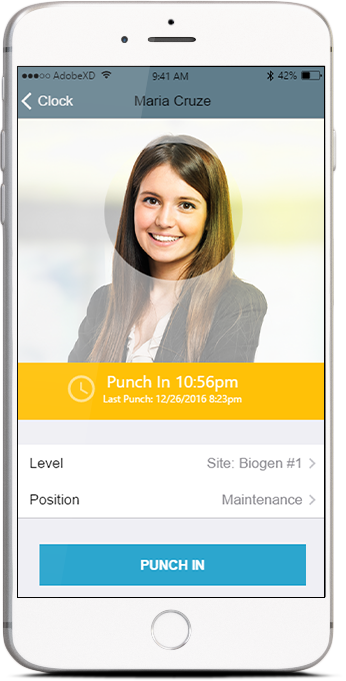 Backed by an advanced web-based time and attendance system that will play nice with your existing payroll or time and attendance application. Save up to 5% on labor costs by using Findd’s biometric time clocks. A mobile solution, available on every smartphone or tablet in your business with complete biometric functionality offline – no connectivity needed. What do you get when you combine worldwide GPS, critical mass with cell signal coverage, and 1 out of 2 people in the world that has a supercomputer in their pocket? Using 3D microlocations and GPS, Findd knows exactly where your people are. 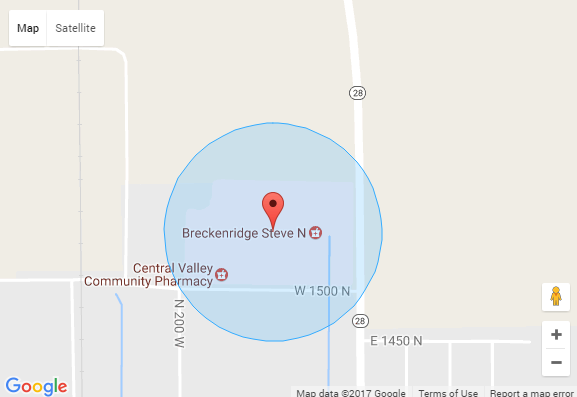 You can use geofencing to create rules around where people should and should not clock in, to ensure they are onsite before punching. The ‘where’ is recorded as part of every biometric record and with 3D microlocation, you get pinpoint accuracy every time – and it’s all from the mobile devices your people and company already have. Some tasks should be completed each shift before an employee punches out from work. Required tasks will prevent a punch out until the employee has selected each task as completed. Optional tasks can be selected based on their occurance during a shift. Tasks are based on context. For each work location in the hierarchy, positions can be created with associated tasks to get fine-tuned job-costing data including the activity of the employee. In addition to setting position, based on work location, positions and tasks can be custom to each employee as well. The most common touchpoint that your employees have with technology related to work is most likley the punch in and out they do every day. This is a natural area to help build new habits of excellence that reinforce a culture of accountability. How does this increase performance? Studies have shown that even the most experienced workers make both small and large mistakes. From airline pilots to surgeons, simple checklists prevent embarassing quality issues and ensure your people are complying with a culture of accountability and discipline. 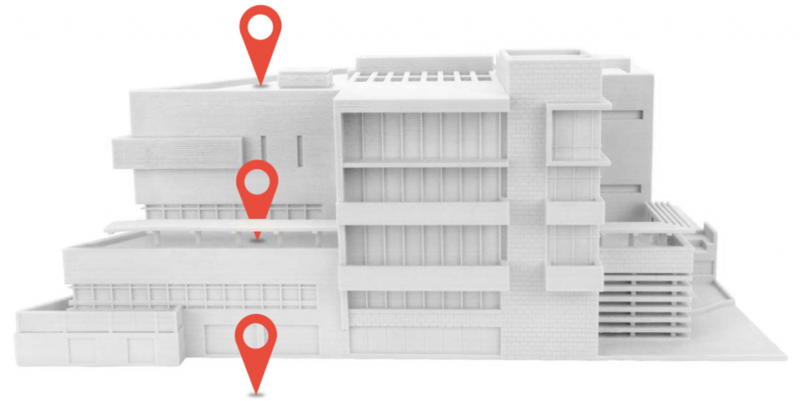 Full location tracking pinpointing your employees whereabouts. When employees punch from unknown locations, optionally trigger an exception. Weekly regular, overtime, and timecard review with approval workflows. 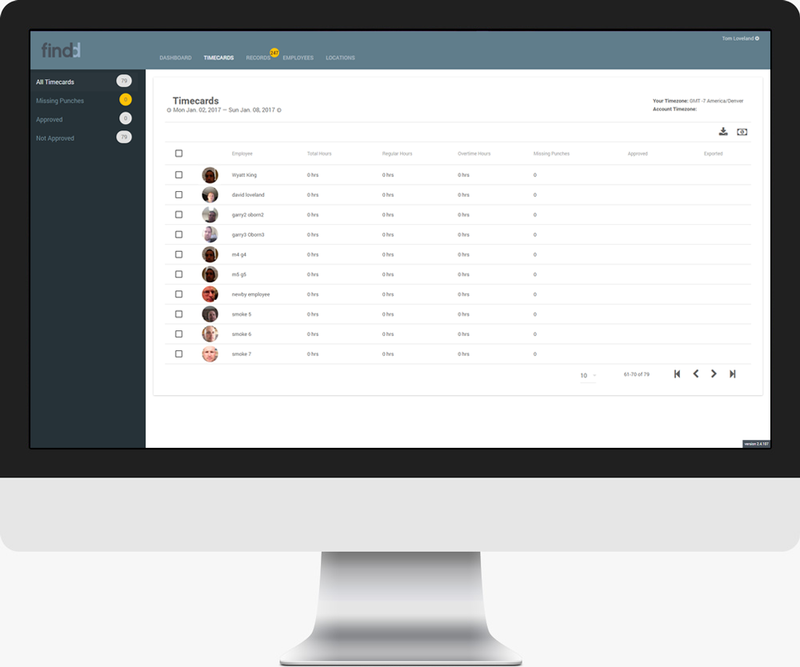 Full customizable organizational structure allowing you to use Findd in the way your organization is already structured. Why Facial Recognition? Peace of mind. Trusting your employees is incredibly important. They are the backbone of your business and create the environment to succeed. Fortunately, there are some things that don’t require trust. You can simply KNOW. Timetracking is one of these areas. With Findd’s mobile facial recognition, you get state-of-the-art biometrics on any mobile device. Why is facial recognition superior to fingerprint readers, hand readers, or other biometric systems? No need to buy expensive hardware. Use any iOS or Android device which means you can afford high-security biometrics everywhere your employees work. 100% acceptance rate. Your employee will never need to hassle with a system that can’t “find” them. They can punch in every time which means more time for your employees and supervisors to concentrate on work and less on the time keeping system. It’s easy! No training required. Nearly all of your employees know how to take a selfie. No need to learn how to use clunky, proprietary hardware that doesn’t work as well as a tablet or the phone in your employee’s pocket. Geolocation and Geofencing. Know where your employees are. 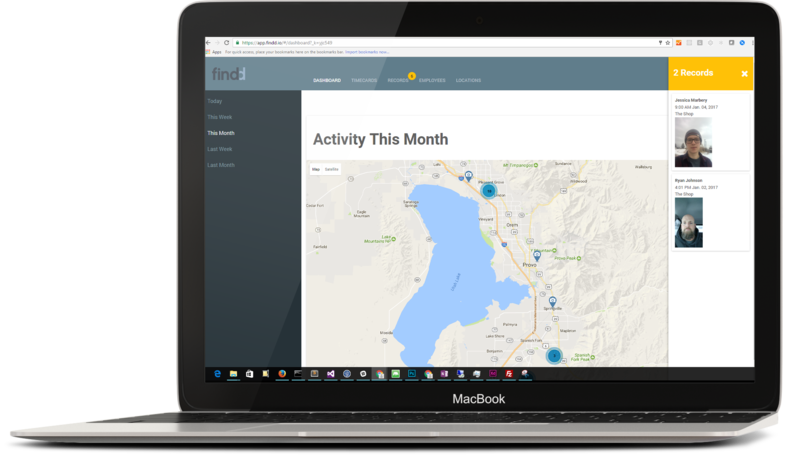 Using GPS location technology, Findd can track the location of your employees. 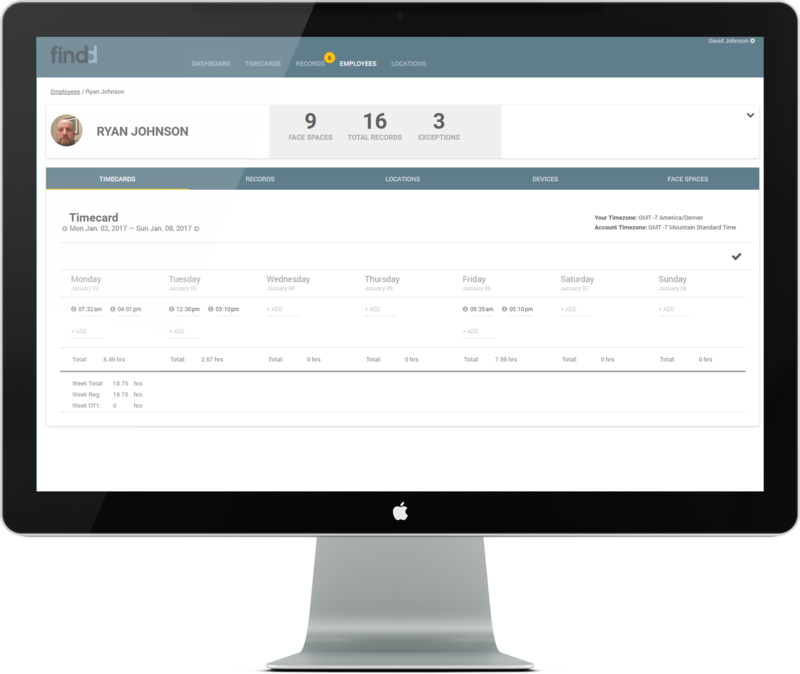 In addition to geolocating each punch, Findd can also be configured to enable a geofence perimeter around a known location; enabling you to ensure your employees are where they are supposed to be. Do you need something more precise than GPS? Now you can know the position of your employees punches even within buildings. Know that your employee is punching in on the 5th floor vs the parking lot for example. The ‘where’ is recorded as part of every biometric record and with 3D microlocations, you get pinpoint accuracy every time – and it’s all from the mobile devices your people and company already have. 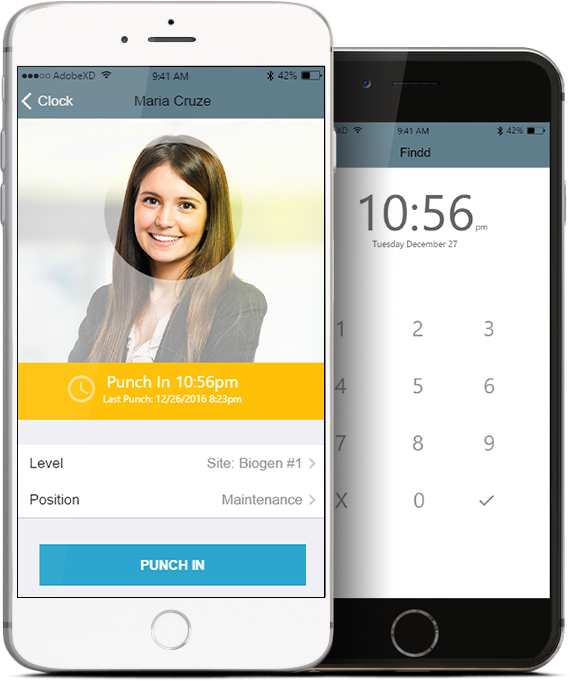 Get a bird’s eye view of your employees as they punch in and out from work. For those that have employees at various locations, the dashboard map gives you the control to understand what is going on in your business each day at each location. 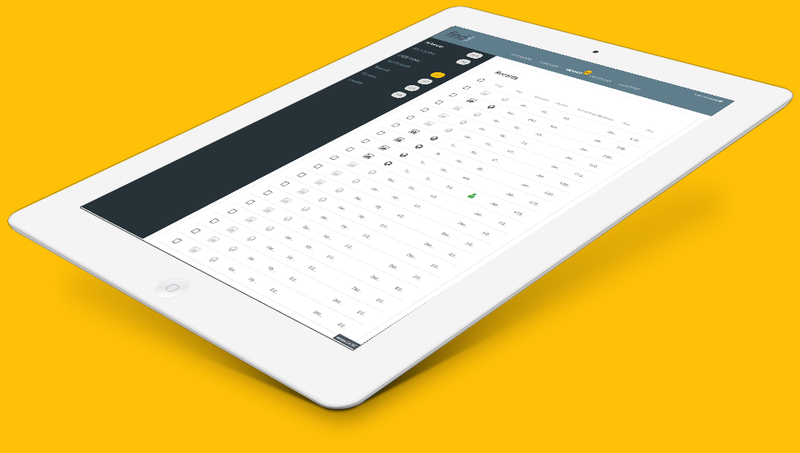 Nothing is more central to tracking time than a weekly timecard. Your organizational structure is unique to your organization. Many companies have regions, areas, sites, and other mechanisms to handle the managerial challenge of running your company. 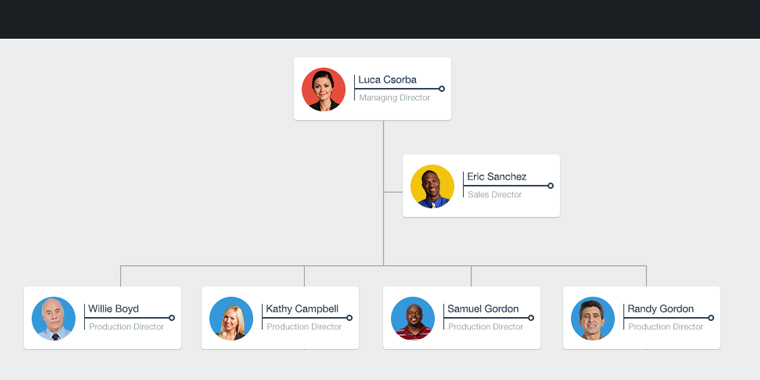 With Findd, you can setup any number of organizational levels and assign role-based administration via our web application. In addition, any level can be a location or 3D microlocation, allowing you to record proper job costing for every punch no matter where it happens in your organization. At Janitronics we have over 1500 employees working at 165 locations and require a solution we can trust to accurately track time and avoid fraud. Using Findd’s facial recognition technology we have full view of every person clocking in. It provides us and our clients security in knowing exactly who is working in our buildings. Findd gives me exactly what we need. I know our people are on site and being productive. I can quickly see all of the punches on the map view and a picture of everybody day in and day out without having to be onsite at each location. WHAT ARE YOU WAITING FOR? READY TO GIVE IT A TRY?